Our Workforce Development Team went a knock, knock, knockin' on a few doors yesterday afternoon with one of our new workforce recruits. Check out the sneak peek shots we got of them going over their wraps before hitting the town. Think you have what it takes to work in the green jobs sector? Not really sure how to go about finding work or enrolling in green jobs trainings? Contact us today if you are interested in learning more about the green jobs field. SNEAK PEEK No. 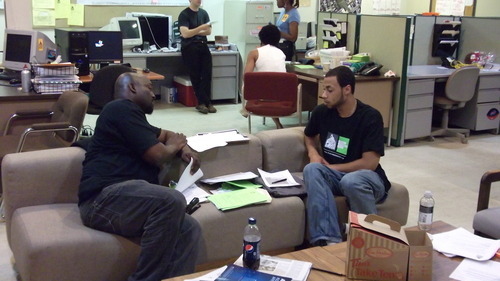 2: Fenderson going over a few canvassing tricks and must do's with our awesome workforce trainee.